This product is available at Fine Saddlery Retailers Nationwide. Click on "Dan's Dealers" to find a retailer near you. 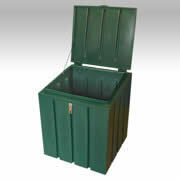 This heavy duty polyethylene bin won't rust or rot. The feed bin is lockable. Our unique poly hinge and cable design, keeps the cover securely open while in use. Holds approximately 300 lbs. of feed.